Evil Web is a true crime story that Carol Jose co-authored with Mary Rich in 1996. It will be appearing on Discovery ID Channel in their new Investigative documentary series that just launched, called "Dangerous Persuasion" which airs at 10 p.m. to 11 p.m. on Wednesday nights. The episode that is based on their book is the sixth in the series, and will air on Wed. February 20th, featuring three of the victims -- Mary Rich, whose story it is, her daughter Cinda, who rescued her from the clutches of self-proclaimed minister and "chosen servant of Christ" Ron Larrinaga, who was actually the violent cult abuser of 20 minor children and three adults. He was tried and convicted on 38 counts of sexual and physical abuse of children, and sentenced to 180 years in jail. Larrinaga is presently serving that sentence in a Florida prison, as after eluding police for years by running state to state to elude the charges, he was finally tracked down in Palm Bay Florida, brought to justice. and was tried and convicted in Brevard County court. How Cinda and her father and one of Larrinaga's children succeeded in rescuing Mary and the children is a riveting horror story. The Discovery ID Dangerous Persuasion series will be shown in the United States, on Bright House channel 143. Other channel numbers on Dish, and other TV channel providers. It will also be shown in Canada, and the United Kingdom (Britain), under different titles. 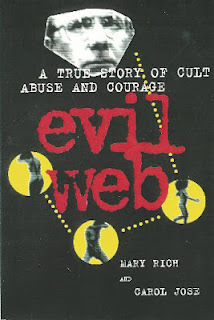 Evil Web can be purchased in hard or softcover or in a Kindle version on Amazon.com.